Last major update issued on November 15, 2004 at 02:20 UTC. The geomagnetic field was quiet to active on November 14. 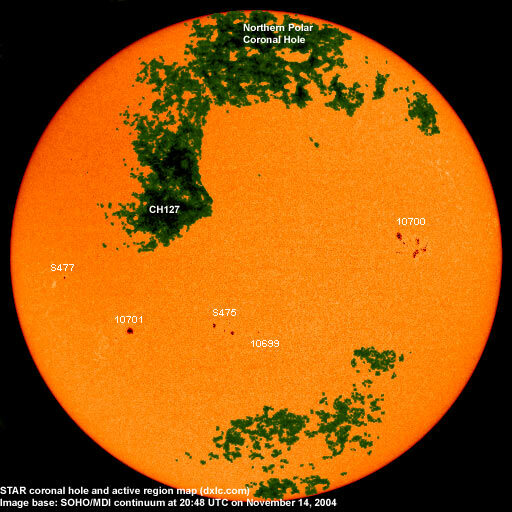 Solar wind speed ranged between 420 and 509 km/sec under the influence of a high speed stream from coronal hole CH126. Solar flux measured at 20h UTC on 2.8 GHz was 100.3. The planetary A index was 9 (STAR Ap - based on the mean of three hour interval ap indices: 9.0). Three hour interval K indices: 42222221 (planetary), 43321221 (Boulder). Region 10699 decayed very slowly and could become spotless today. Region 10700 merged with region S474, it is no longer possible to separate the positive polarity areas. The region as a whole saw a substantial increase in penumbra area. C flares are possible. 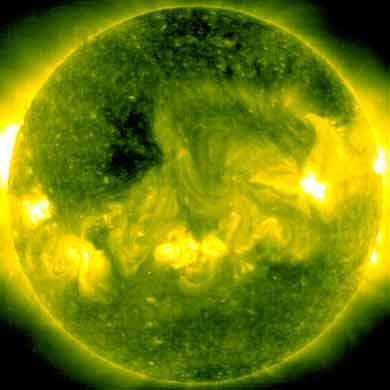 Flare: C1.2 at 14:16 UTC. Region 10701 was quiet and stable. [S475] A new region emerged fairly quickly east northeast of region 10701 on November 12 and developed slowly on November 13. Slow decay was observed on November 14. Location at midnight: S14E06. Flare: long duration C1.0 peaking at 09:25 UTC. [S477] A new region emerged in the southeast quadrant on November 14. Location at midnight: S03E49. November 12-14: No obviously Earth directed CMEs observed. Recurrent coronal hole CH127 in the northern hemisphere will likely rotate into a geoeffective position on November 15-17. Processed SOHO/EIT 284 image at 19:06 UTC on November 14. The darkest areas on the solar disk are likely coronal holes. The geomagnetic field is expected to be quiet to unsettled on November 15-17. 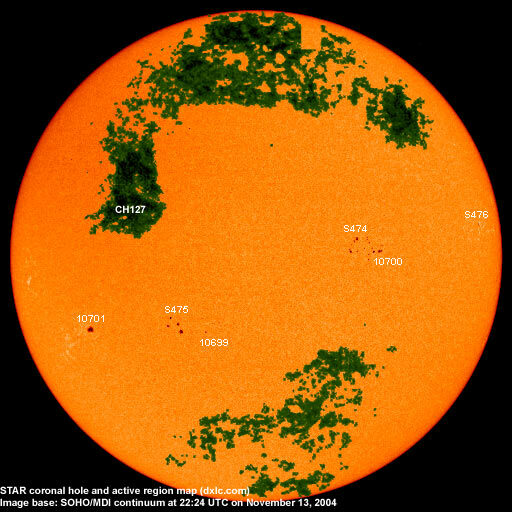 A high speed stream from coronal hole CH127 will likely begin to influence the geomagnetic field on November 18 and cause unsettled to active conditions until November 20. Long distance low and medium frequency (below 2 MHz) propagation along east-west paths over high and upper middle latitudes is useless. Propagation along long distance north-south paths is very poor. Trans Atlantic propagation conditions are normally monitored every night on 1470 kHz. Dominant station tonight: none, only a carrier detected. Carriers were noted on other frequencies as well, however, no audio was heard from any trans Atlantic stations.